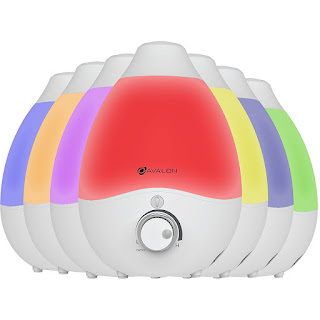 Today ONLY - Avalon Premium Cool Mist Humidifier With Aromatherapy Essential Oil Drop Diffuser, With 7 Adjustable LED Lights, Ultrasonic Pure Silent Technology ONLY $29.99 (Retail $39.99). •GREAT SIZE: Our premium 2.8 liter humidifier is 11.4 x 8.5 x 8.5 inches, and is equipped with 7 different color changing LED lights and adjustable settings for the LED "carousel." •AROMATHERAPY: It contains a large built-in diffuser! All you need to do is put a couple drops of your favorite scented oil onto the sponge and in a few moments you will be in heaven! •ULTRASONIC: Unlike other humidifiers, this mist humidifier has quiet ultrasonic qualities. Its soft hum allows you to have a peaceful aromatic experience each time! •LONG-LASTING: This LED ultrasonic cool mist humidifier can last up to ten hours on a moderate setting. It saves you money by automatically shutting off when water is running low! The mist output nozzle can be rotated to blow the mist in any desired direction you choose. •SAFE FOR CHILDREN: With ETL Safety Approval, this humidifier is safe for children. It can purify the air, eliminate bacteria, and reduce dust levels wherever it is used!